There are two ways Narendra Modi can run his government. First, carry on with the broad schemes the UPA came up with, just execute them much better, in Modi-style as it were. So, for instance, genuinely ensure PSU autonomy but, like the UPA, dont privatise them as that will upset the trade unions. Two, come up with a completely different paradigm. In the case of PSUs, to stay with the example, that will happen if all government shareholding is transferred to a Temasek-type fund where the government equity is under 51%this will not just give the PSUs autonomy, it will liberate them from the L-1-itis that currently hinders their growth and also ensure the CBI/CVC/CAG dont interfere with how they are run (see Indias own Temasek, http://goo.gl/lCe4Uk). If Prime Minister Modi is to opt for a new paradigm, this must include a whole new way of dealing with state governmentsthe PM-CM partnership that Modi talked about during his election campaign. Given how so many BJP chief ministers, including Rajasthan chief minister Vasundhara Raje who is believed to be joining the Union Cabinet at some point, have campaigned against the Centres tied-aid and step-motherly treatment, fixing this has to be a priority item on Modis agenda. Indeed, Modi indicated as much when, during his campaign days, he said that if a state wanted to build irrigation canals but the central funds available were for roads, he would allow this diversion. Former disinvestment minister Arun Shourie, for instance, was the first to point out, in an interview to this newspaper, that states could be allowed to come up with their own laws even if they were on the concurrent listlabour laws are on the concurrent list and so, convention is, they cannot be changed unless the central law is changed. As long as the central law says firms with more than 100 persons require government permission to shut down, no state can change its law to make this 300 persons or 1,000 persons. Not true, says Shourie. Article 254(2) allows the state to change its law, provided it gets the Presidents assentand that essentially requires that the Centre asks the President to do so. Using Article 254(2) imaginatively could be the first step in the Modi PM-CM partnership. A related issue, coming up with increasing frequency now as states line up for special category status, is that of more funds. There are two issues here (see table). The first is the creation of the Indian Cess Service, if you will, over a period of time. Instead of increasing taxes, the UPA particularly, simply put a cess on various taxeswhile this raises the tax collections, the cesses are not shared with the states using the 32% Finance Commission formula. So, either cesses have to be shared with states, or the Budget has to abolish cesses. Related to this is the issue of non-tax revenues like petroleum levies or telecom levies like licence/spectrum fees as well as auction amountsthey add up to a tidy sum but dont get shared with the states. Were they to be shared, chances are few states will be lining up asking for special category status since this will actually give them more revenues. as ex-CACP chief Ashok Gulati has been advocating, states like Bihar would get a lot more money than they could possibly get under a special category status and, more important, agriculture in the state would really take off. More so if the water/irrigation subsidies given to the Punjab farmer are given to them as well. The way the Budget can do this is to cut the overall farm subsidythe PDS as well as fertiliser subsidiesand to pass on a large chunk of this to farmers on a per-acre basis. To get back to the issue of tied-aid, or the Centre very largely directing the states spending in various sectors, the way to fix this is to increase the amount of money transferred to states via the Finance CommissionRajasthans finance secretary Subhash Garg is an encyclopaedia on the subject and the state has submitted a comprehensive note on this to the Finance Commission, parts of which have inspired this column. According to the note, the total transfer of non-tax funds from the Centre to the states adds up to anywhere between 25% and 30% of the Centres net tax revenues. MGNREGA for creating irrigation canals, is one such planwhile the need of the hour is to scrap the schemes. This is the difference between Modi coming up with a new paradigm and Modi just implementing the UPAs schemes in a more efficient manner. irrigation, or vice-versa. 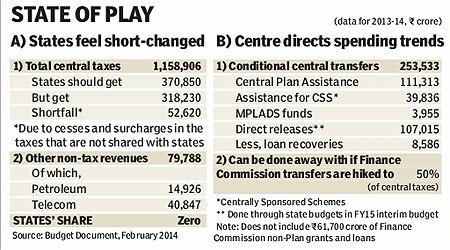 More Finance Commission transfers are the only way. Not all of this can be done in the Budget, but a mention can be made, with the details to be fleshed out by the Finance Commission before it comes out with its report. Many of the UPA schemesMGNREGA, Food Security Act and Land Acquisition, Rehabilitation and Resettlement Actwere just a bad idea and need to be junked. Modi wasnt given a mandate to run the UPAs schemes more efficiently. He was tasked with coming up with a new paradigm.